I finally got around to making my new piece into a pillow. I started out with a plan to make a simple folk art dog and then I started thinking about my guy. While I was doodling with my dog design, I got some silly ideas in my head and this newest piece is the result of my warped imagination. 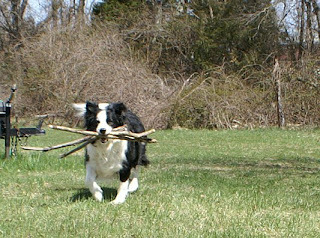 This guy grabbed a stick that had someone living in it. The little birds have decided to come along for the ride. It is a fun piece that will make you smile. This piece is for sale and will be part of a pattern package. If you are interested in this piece, send me a mail with a reasonable offer and it could be yours. 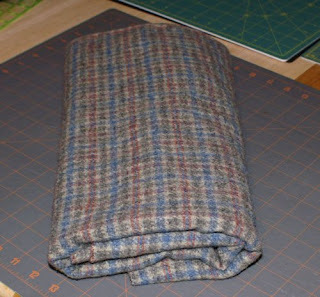 The piece is slightly larger than 6" X 5" and has a brown plaid, wool backing. I have been taking a break from punching this weekend and working on a secret project. One I cannot show until the challenge date has ended. I thought sewing would rest my hand, but I think I definitely punched way too much, so I will have to limit my punching time from now on. 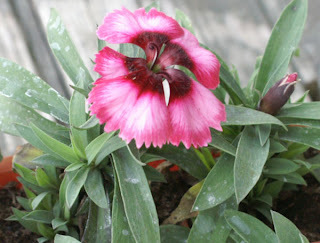 We had such a beautiful weekend and we enjoyed it by getting things done around the house. My big buy was flowers. I thought it was time to get my yard back in shape, so I got a few colors to perk up the place. I also got seeds to grow, but today was so hot, I just made a little garden around my tree. 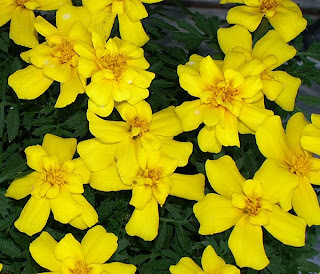 Here are the flowers I bought for my yard, most will go in the front of the house. I will plant the seeds and the rest tomorrow. I can't wait for the sunflowers to grow, I got a new variety in a red shade, so it will be fun to see how they look. 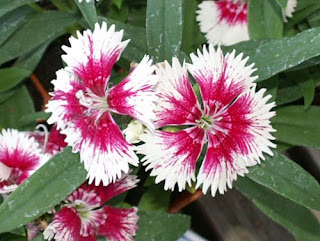 I tend to go for flowers that are different and have vibrant shading. I do hope they fair well in my gardens. I was at it again today. This time I took what was left of some old floss and the pearl cottons I had. 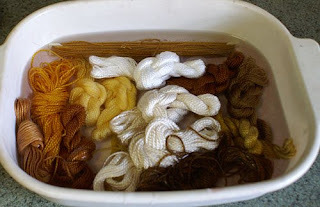 I threw them all in a bath together and tried to make my own version of khaki drab. This is what they looked at before hand. 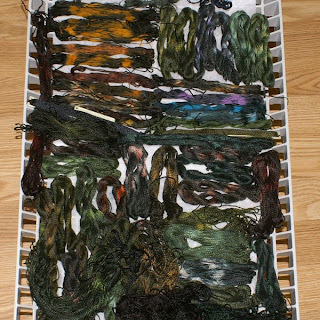 For the dye, I used rit dyes and one part black, one part blue and about 4 parts yellow. This is what came out of the pot. It lightens as it dries and this is still wet. I also meant to mention, I did two skeins on plastic holders and they came out flat, so twisting is a good way to get varying colors. Another trick is to use a baster to baste the colors on. 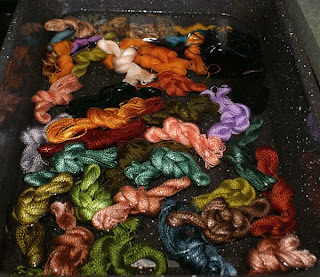 Once I have dyed them, I rinse a little and then pour vinegar onto the skeins. Then I add a little soap and rinse clean. I have noticed that without vinegar, the colors keep bleeding out, but once I use it, the color stays and rinses clean. I got some interesting combinations and the pearl cottons will be great for big stitchery on quilts. I finished a piece tonight using some of the purple shades and as soon as I finish mounting it, I will show you how it came out along with some other new pieces I have made. 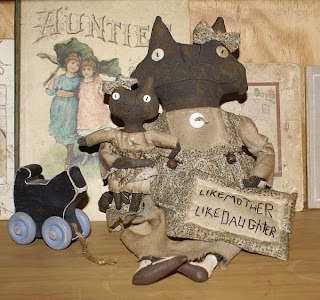 I got a package in the mail today, I have to treat myself sometimes;) I won a kitty doll set from Miss Pootie's Primitives. Penny makes the most wonderful creations with sayings and I just loved this one. My husband and I area always saying our daughter is like him or I. You could say we each blame each other for her horrible behavior, lol. It is just such a fun piece and she really pays attention to detail. I put her with the books for now, but I will make a special shelf, just for her. This weekend, one of my groups had a virtual retreat and flowers was the theme. I decided to make a piece based on a fraktur and then I got the brilliant idea to use some old pearl cotton I had. Then I decided to try watercolor on some laid paper I bought. I read that the original frakturs were done on laid paper. I usually use heavier weight water color papers. 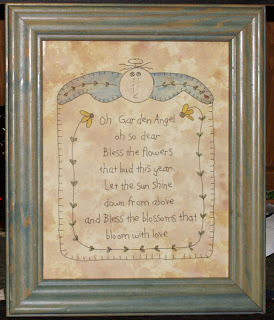 I used a freebie design by Twigs N Sprigs to make this cute little picture with saying. It is done in black ink and then I used watercolor pencils for the colors. After I painted it, I let it dry a bit and then used watered down antique ink to age the paper. It came out nicely and the paper held up well, to the water. 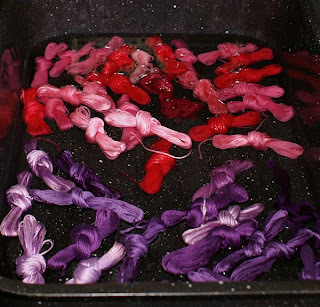 Then today, I decided to over dye some floss. 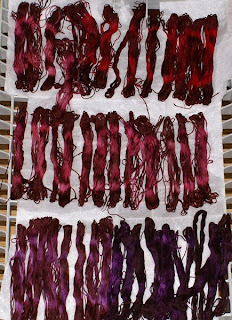 I used rit dye over pinks and purples. I used about 1 part black, 1 part green and 2 parts red. I tend to add colors and when it looks right, I pour it in. Here is what it started out as. And this is what I ended up with.T he purples go from light to dark shades and the pinks are dark to light. It will be fun to see how they punch up. Unlike the poor folks out west, we had wonderful weather this weekend. I took full advantage of it by spending the day shopping and going for a walk at one of our favorite places. 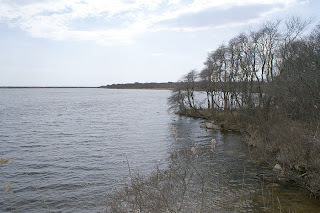 It is a bird sanctuary that cuts through fields, wooded paths and ends up at a point where we can view the pond and the ocean which is beyond the strip of sand dunes. On the trail back, we go through more woods and by a small pond which was showing the first signs of spring. 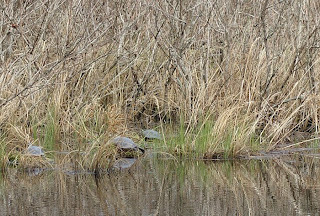 We got to see the turtles sunning on the tufts of grass and minnows. I didn't have any luck at the antique stores, but I did find some nice reproduction candle holders with plate backs. I found two and will figure out where to hang them. I am also working on punch projects, some I can show, so as soon as I finish them, I will post photos. And don't forget to look below and grab your free pattern and a chance to enter the contest. 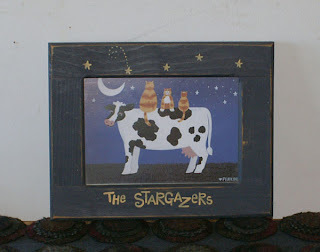 I have been working on a couple of my own new pieces, as well as Lynette's new designs. This piece was one I found from an old sampler and wanted to try the dog and cat in my own version of a punch. I just loved the funky shapes and the stick legs. First is a picture of the piece, after I finished it, as is. I then used the Walnut ink and it came out ok, but the flower was too bright. So, I decided to use the Java ink, which is black. For those of who asked and did not see the original post, I use Walnut ink made by Tsukinek. You can look up the product online and see where they sell it retail. That is the best way to find out if you can buy it in your area. 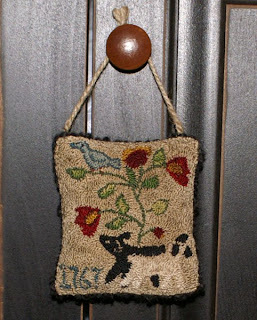 I usually use the walnut ink on my punch needle pieces and the Java ink on extreme prim pieces. I will be including instructions on my methods with the new patterns that come out. Don't forget to check out the free pattern and contest, it is still going on! Recently, I have been asked by Lynette Anderson, to create samples from her wonderful quilt and stitchery designs. Lynette is an Australian quilt designer who creates whimsical patterns that appeal to primitive and folk art quilters. For a practice run, I decided to make a design from her free block of the month patterns; Noah's Ark. I took three different designs and incorporated them into one punch needle design. After I made the design, I made it into a cupboard hanger and antiqued it with walnut spray. 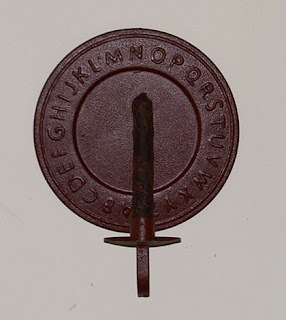 It really gives a nice aged look to the piece. Lynette's designs were so fun to punch up, that we thought you might enjoy making one for yourself. 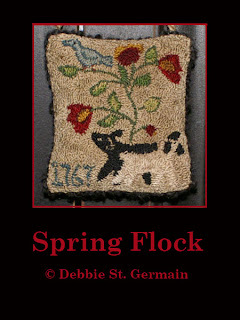 It is a preview of the new punch needle pattern line that Lynette will be offering in the future. If you would like to get your free pattern, visit Lynette's Blog. You will find instructions on how to get your free copy and a clue to a contest she is going to run in conjunction with the new pattern. 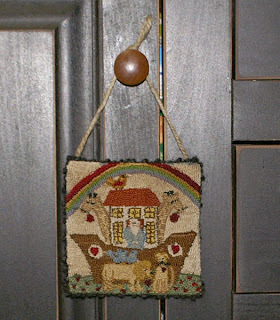 Please remember to leave a message and feedback on Lynette's designs in punch needle. I thought I needed to get out and have a fun shopping day, so I hit the local stores and consignments. You just never know what you will find in a home store and sometimes I get lucky. 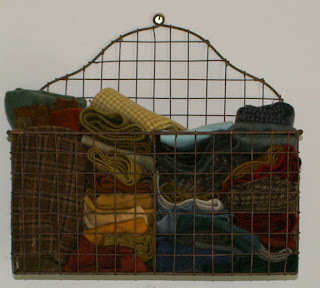 I got my first wire basket at a primitive store in Mystic, and was so happy to find this one at our local store. It is large and has two compartments, perfect for small pieces of wool. 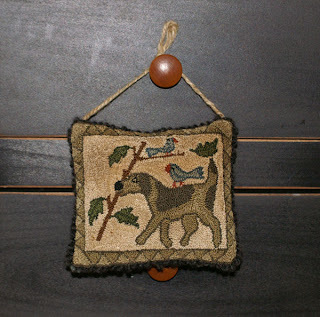 I hung it next to my cutting table, so I can snag a piece whenever I need a small piece of wool in a project. Today I had to hit the library, so thought, since I was out, why not hit the consignment nearby. 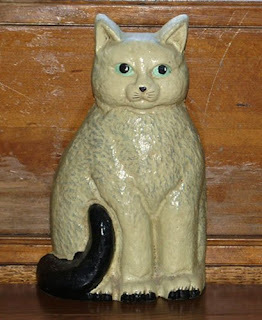 I actually found a cast iron cat doorstop. They are hard to find, especially good fake ones;) It may not be a Hubley, but good enough for me. 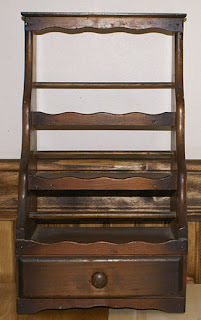 Both consignments had loads of new antiques in, but most were musty, I do not do musty or moldy. Now, the Surprise? Well it is a secret, at least until Sunday night. So if you come back Sunday night, you will see a new blog featuring a free punch needle pattern that I made from a certain quilt designer's patterns. I will be working with her in the coming months, working on samples for a new line of punched patterns, so don't forget to come back on Sunday. For those of you who have asked for the Fraktur Rabbit in a pattern, you can now get that and my newest sheep pattern in one PDF pattern. I am offering it as an epattern on my ecrater site, Woolensails, which you can link to, in the upper left hand column. 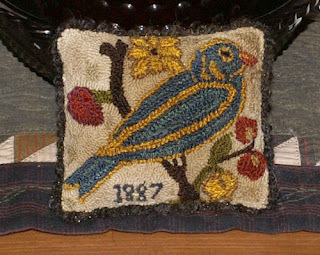 These patterns are great for punch needle and rug hooking. I just love thrift stores, you never know what you will find. I am always on the lookout for shelves and items to store things and found this great wall shelf with drawer. 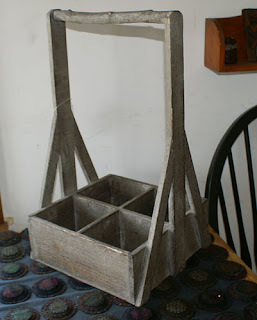 I am not sure what is was actually for, but it looked like a great spool holder to me, so it will be going in my sewing room. Then while I was looking at items, my husband comes up with a picture he found. It seems a lady was also looking at it and my husband grabbed it, because he knew I would want it, lol. Yes, I am making my poor husband into a thrift store junkie. It is a picture by Donna Perkins. I love the frame it came in too. I also found something neat for a friend, but I can't say what that is;) And the find of the day was a yard of wool for only two dollars. I love plaids and it will be great to over dye. Something I don't have to cut up, before I use, love that. I finished a new piece and will be listing it on ebay tonight. 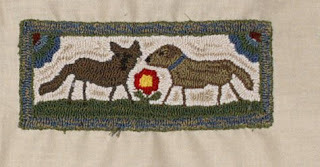 I am having so much fun going through old sampler books and finding motifs that inspire me. I am going to be punching a lot of new designs in the coming months and as soon as I put my computer equipment back in one place, I will work up the patterns for them. Hopefully I will stop procrastinating and punching, long enough, to get them done next week. This one was inspired by the sheep, I loved their naive look. I just had to make a piece with them and traditional sampler motifs. I love how this piece came out, but I will probably tweak the design some more, I think a nice border would be perfect with it. 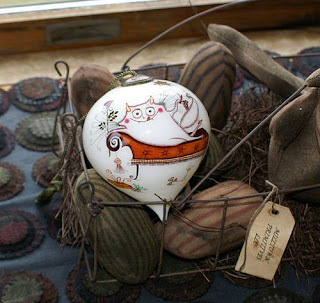 I am not sure about other designers and crafters who create pieces for sale, but I never have any of my items for me. I always end up selling them or giving them as gifts. I do keep all the beautiful pieces made by my friends and I also have patterns from other designers that my friends give me. I always make those up for me. I have one that I made up and still need to mount, so I guess I should finish that one, so I can hang it. My sister sent me a surprise package this week. Last year she was in a bad car accident and she almost did not make it through the first night. Thank God, she made it and although it has been a long recovery, she is doing much better. Being so far away, I wanted to make her something that would make her feel like I was with her, at least in spirit. 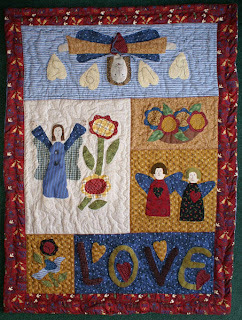 I made her an angel quilt with sayings and at the top of the quilt I put an angel with her arms outstretched and hugs. This was my first real quilt and got me into quilting again. The reason the angel is backwards, is because it is a lap quilt to comfort her and I wanted the angel facing her when she was using it. 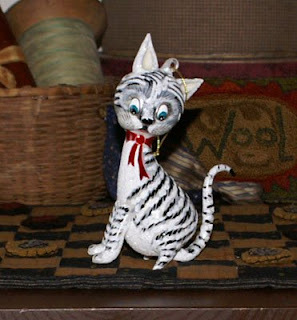 She loves that blanket and wanted to send me something and knows how much I love cats and collect cat ornaments. I have been busy with a new project and will talk about that soon.